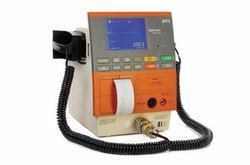 Offering you a complete choice of products which include defibrillators-bpl monophasic df 2509/r, patient monitor-bpl excello, defibrillators-bpl biophasic df 2617/r, defibrillators-bpl biophasic df 2617/r/aed, defibrillators-bpl biophasic relife 900 and defibrillators-bpl biophasic relife 700. The Excello comes with a 10.4" TFT color display and is capable of drug dose calculation, HRV analysis and Oxy-Crg in addition to the starndard configuration of ECG, RESP, Masimo SpO2, NiBP, TEMP. It comes with a rechargeable battery, networking capabilities and a maximum display of 10 waveforms. Equipped with 24 event recording and remote charging through paddles, the DF 2617/R comes with a sharp bright LCD display and easy to use interface. DF 2617 AED is a current controlled biphasic defibrillator with guided CPR . Enables storage, recall and printing of events, and AED with voice and visual text prompts; records ECG before and after shocks. The Relife 900 is a biphasic defibrillator with a clear 7" LCD screen and comes with features such as remote energy selection, remote charging and discharging througn paddles, patient paddle contact indication, 24 event memory, synchronised cardioversion and metronome signals.Its current controlled bi-phasic waveform lowers the electrical threshold for successful defibrillation.With value added functions like AED and thermal recorder for your defibrillation needs. Masimo SpO2 and Suntech® NIBP are available as optional features. 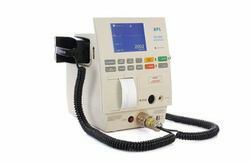 This biphasic defibrillator is an intuitive, user friendly, lightweight device capable of remote control through paddles, autotests before and during operation and supports flexible power supply. It can be used for adults as well as paediatric patients. 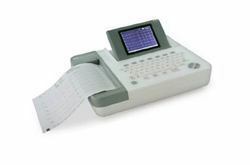 A feather light single-channel ECG machine that spells out compactness and user friendliness from the word go. While the sequential acquisition is done through the manual mode, it also helps you acquire simultaneously through automatic mode. The device uses thermal printer and comes with a built-in rechargeable battery ensuring backup. the Ultima Prime with a clear 12.1" TFT high resolution color display. 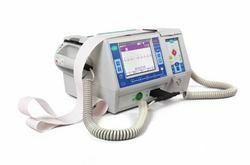 It is capable of the standard configurtion of measurements and also features a host of other capabilities such as a 168 hour trend review, patient ECG monitoring, CNS connectivity, rechargable batteries and drug dose calculation. 60 minutes operating time in fully charged condition. Cardiart 9108 comes with a QWERTY keyboard and a high resolution foldable 5.7" display. This device is easy to use, measure and can store upto 200 recordings in its internal memory. 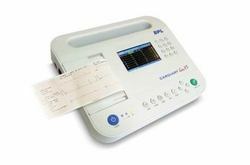 It enables simultaneous 12 channel ECG recording with 12 lead simultaneous acquisition. 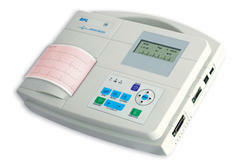 The 6208 view is a simultaneous 3-channel ECG reading device with auto summary. It has a built in rechargable battery and enables the simultaneous acquisition of 12 leads. It is equipped with a large LCD display and has USB connectivity.